Avatar is about Jake Sully whose brother has recently died. 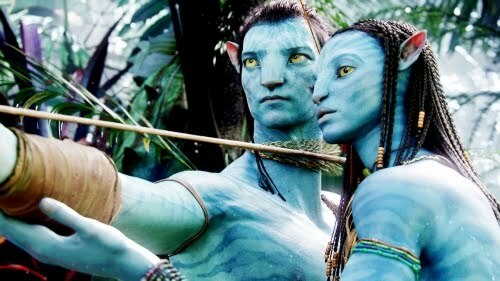 Jake was a Marine, but now the Army wants him to take his brother’s job, which was being a scientist and studying the Na’vi, a species of blue creatures. Jake, Na’vi experts/scientists Grace and Norman and a group of Marines travel to Pandora the home of the Na’vi. But Jake doesn’t know that the Marines want to kill the Na’vi and steal the minerals so that they can make lots of money. Jake must choose: will he help Marines kill the Na’vi or will he fight the Marines to keep the Na’vi alive. With visually stunning CG, Avatar looks amazing but it’s moral has been retold in different ways more than once. From the Planet of the Apes saga to the Harry Potter saga, the moral “everyone should be treated equally” has been done before. It’s good to do it again, but the original part of the story is a little too simple. And then just when the story is getting complex the action sequences become the focus. The middle is slow but it develops the story and the CG animators show their skill. The film doesn’t feel like it’s three hours until the overlong climax. There were some unnecessary zoom ins and zoom outs. There’s also the debate about if Avatar really deserved to be a Best Picture nominee. Is it that good? Or is it just another special effects filled blockbuster? In my opinion it’s both. The climax was too long, the cinematography wasn’t great, the moral wasn’t new and the story was simple but the special effects are excellent, the characters were unique and although its simple the story was interesting. My favorite character is Jake Sully because he, despite his injury and the tough choice he had to make, kept going. My favorite scene is when Neytiri shows Jake, Pandora. Avatar is rated PG-13 and I agree. Flick, your review is right on – very perceptive and well written. In my opinion the action and story were equally balanced. I’ll post my review soon!!!!!!!!! I agree it is a good movie and it deserves a high rating. The good thing about it is that it ventures into a new issue of technology limit and moral issue. Haven’t seen this movie, but I have it on video and will finally get to it. Hard to keep up!